Jean Pierre was an excellent guide for the city tour. We had a different guide for the Ice Hotel. This tour was fantastic! Our visit to the Ice Hotel was on the last day before it would be torn down for the season. Both tours were informative and interesting. Quebec City is a beautiful place to visit! 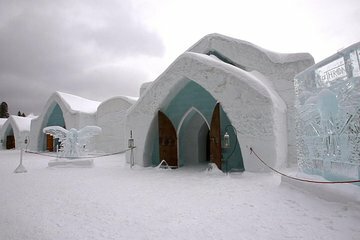 I would highly recommend this tour for anyone visiting later in the year (November through March) when the Ice Hotel re-opens with a new theme. Our city guide was well informed and communicated effectively with visitors from different countries. The ice hotel trip was worth it. The tour was split into two. The morning was purely City tour and the noon for the City tour. For the City Tour, Jean Pierre was very knowledgeable of the history of Quebec City. We stop over to some locations so we have time to take pictures and go around e.g. Palace Royale. The Ice Hotel tour was also great. I wish I was dressed for the weather so I can go tubing. It looks fun. The Ice Hotel were also incredible including a chapel made out of Ice. The weather is so cold and it was below 17C. But I think it will be more festive if I visited Quebec during Christmas holidays. March was almost end of the winter festival but at least I got to see the Ice hotel still intact. Highly recommended and dress really warm. The tour of Quebec City was fascinating, our driver Daniel was very knowledgeable and funny. The ice hotel is amazing and should not be missed.